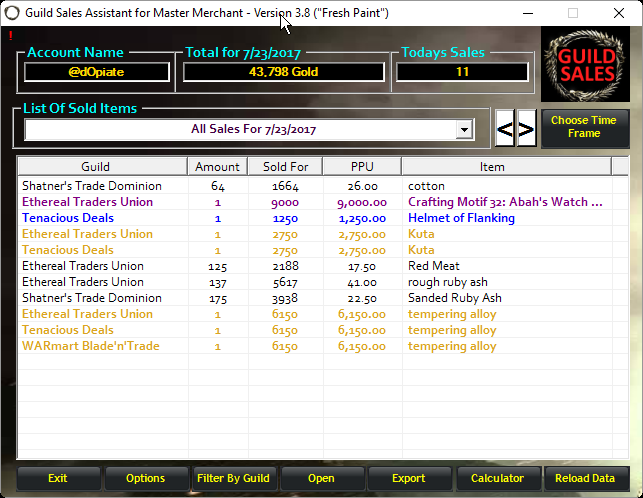 Have you tried Guild Sales Master? It's the perfect companion to GSA! 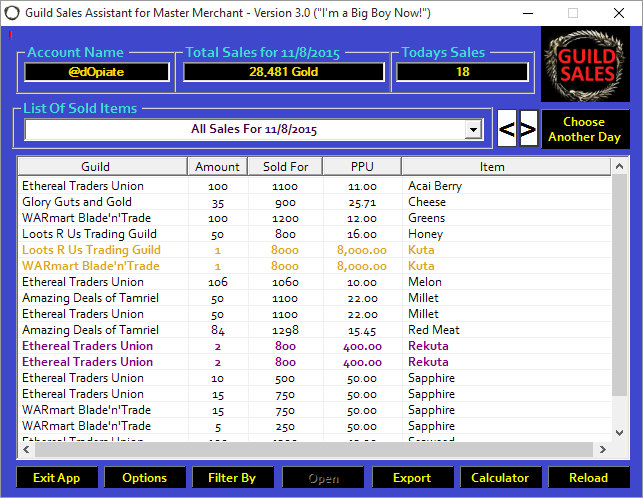 "Using Master Merchant like you should be? Awesome, how about an offline analysis tool! No login necessary. 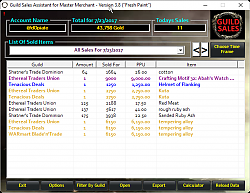 Great way of keeping track of what you're selling in guild stores and helping you then go and craft more." "Want to go Nerd in Nirn? 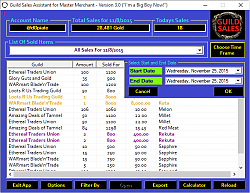 – then get Guild Sales Assistant for Master Merchant and build an offline database with a great analytic tool set so you can really track what you are selling in your guild stores." 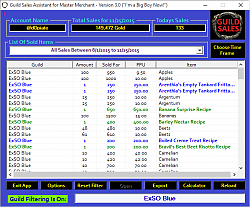 You MUST have GSA and MM both enabled if you wish to get any new sales offline. 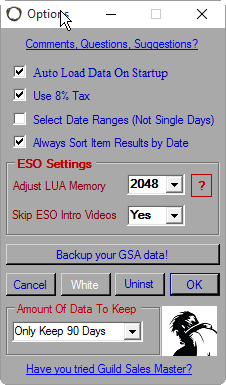 GSA no longer has an in game GUI. To get the offline component working. 4 - then ONLY after you have logged out the FIRST TIME - follow the steps in this video (yes the number of files in the zip has changed. 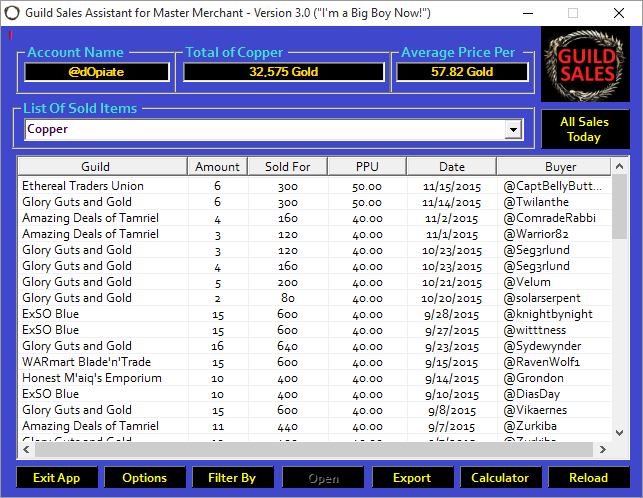 Thanks to the hard work of Philgo68 we were able to make it possible to run GSA and Master Merchant together. Reminder: You must have .Net installed if you plan to use the offline tool. If you aren't sure if you have it you can get the latest here - it will not hurt anything to install it or upgrade to the latest one. I am letting everyone know now so there are no bug reports because you didn't get .Net Framework installed! 3.9 - minor fixes, tried future proofing a bit more - this is the LAST version. Unless there is a program ending bug, this is it! This was added as option so your database doesn't get too big with sales that are no longer relevant. New Look! Large sections of code re-written! reminder: don't forget about the options menu! version 2.2.2 (1) - No functional changes just made my manifest file Fast API compatible. version 2.2.3 - "protection mode" - I'm getting bad data from MM and I am trying to protect your DB so this release will only let you view your history until Phil and I can get things worked out. version 2.2.4 - updated to work with the new patch - some history will be missing but should be picked up in the next version. version 2.5.0 - transitioning to new format while supporting the old still. Nothing function has changed, it's all under the hood. Preparing for the future. 11/15/2014 - Initial release Version: v.08 (just the LUA engine for users to start collecting data). 12/11/2014 - Offline component optimized and given a "face lift"
------------- as stated in the forums this is a totally optional update. ------------ item and it will take you directly to the detailed history for that product. 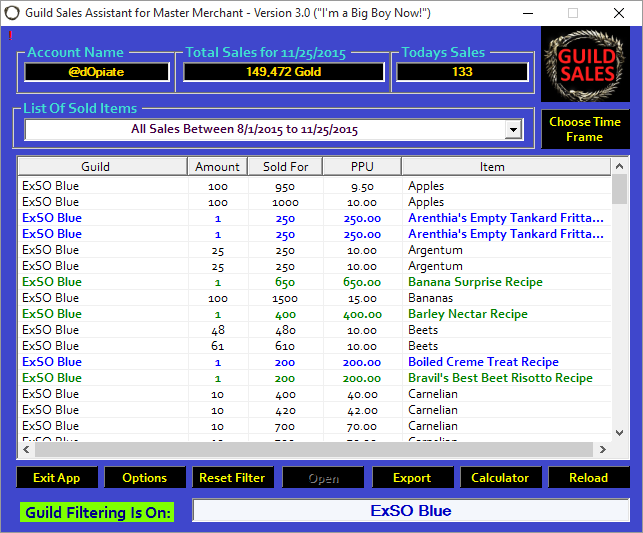 ------------- date with newest sales listed first (no more double clicking the column header! ------------- Will use whatever program csv is associated to in Windows. I have multiple machines and this is how my grid (listview) lines look on different ones! (btw never use listview - GRIDVIEW only for those future .NET programmers). and I get this now?!?! I don't know whats up with .NET and the XP Visuals or No XP visuals or whatever but I'm sorry if you have not grid lines for a long time. I actually didn't know. ok that is what's fixed in 1.5b - along with the report title issue. 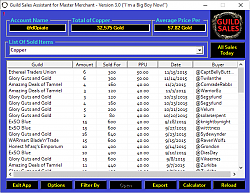 01/15/2015 --All columns are now sortable, this now includes all monetary columns. 02/03/2015 --Fix a very hard to find bug that added new sales twice when you hit "reload data"
Last edited by Xvery : 04/01/19 at 06:16 PM. Any ideas how to fix this issue between MM and GSA? unhandled exception has occurred in you application. 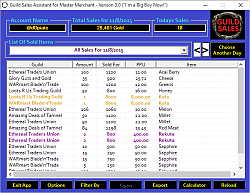 System.IO.DirectoryNotFoundException: Could not find a part of the path 'C:\Users\Gerard\Documents\Elder Scrolls Online\live\AddOns\GuildSalesAssistant\AddOns\GuildSalesAssistant\GuildSalesAssistant.txt'. Last edited by RavenMind : 02/13/19 at 03:12 PM. Thanks for the info xspertone. Out of curiosity, besides the LUA error, what happens (or doesn't happen) if you run both addons together? With GSA enabled, MM never gets past its initialization. EDIT: With the MM change posted on MM comments page, I was able to get GSA working along with MM. MM is sending a nil value (the variable epochBack doesn't exist, it's in extraData) and that's causing GSA to fail when it checks the timestamp values in the saved data to trim it. Anyone with a text editor (notepad++ is pretty good) can open up the file and edit it themselves to get their sales data working again. You only need to do a /reloadui after making the change to see it working. Last edited by fenrock : 02/13/19 at 07:09 AM. Last edited by xspertone : 02/13/19 at 06:49 AM. Hi all, the issue (I believe) is in MM. I've posted a fix over on the MM forum. Been getting the below error since MM updated yesterday. One of the authors in MM says they think it could be GSA's saved vars, and suggested I look for a function in GSA similar to /mm clean. Any ideas on this one? I'd sure hate to lose my beloved GSA!! Thanks! I stopped playing and do not have the game installed right now so I do not have good news, I'm sorry to say. The issue is in the LUA portion of GSA which was originally written by Phil from MM. I was very grateful when he wrote it and maybe he will have a look at the errors? I'm not great with LUA and I have not kept up with the ZOS changes .. I suspect it would be a 5 minute fix for someone fluent in the current changes. GSA the program should continue to work just fine if that gets fixed. For now I guess just disable GSA. I removed GSA and saved vars. Reinstalled and this same error occurs. Only recourse for now is to disable this Addon until the author has a chance to review. If I don't disable, MM is entirely broken. I checked the data and i found a coruppted one. I deleted it and all worked fine. I think it was a misstake by me, the user as I graped the data out of TESO. If I started the tool, it shows me my sellings. fine. Now I will check a timeperiod like 01..1 up to 23.01 and will see all my sellings the toll sohsw me nothing. 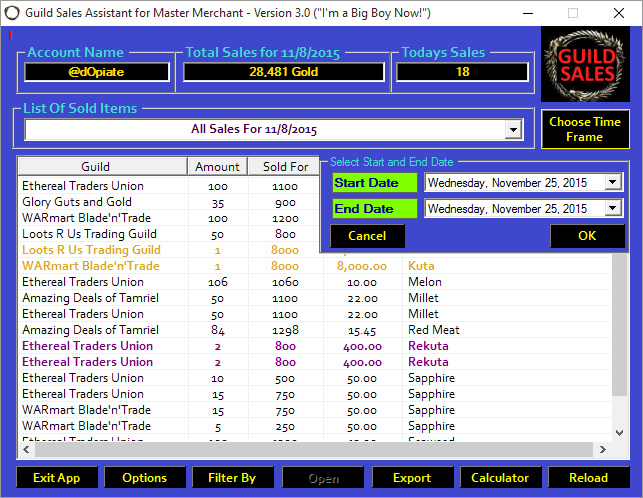 I can select every Item individual, but I am not able to get a complete report of all sellings for teh selected time. Is there a step necessary to do to get a complete report to export it to Excel ? My first hunch is too much data that I didn't properly accommodate for, but without more info it's only a guess. That being said I couldn't reproduce your error. Can you try a smaller range, confirm if that works (help rule out other issues) then try a larger one that you had previously fail. Does it create the file at all? Is the file there but it's empty?